When torrential rains resulted in widespread flooding in Beijing this past weekend, it was a relatively new technology, micro-blogging, that helped mitigate the damage from the failure of an ancient, sometimes under-appreciated, tech – sewers. 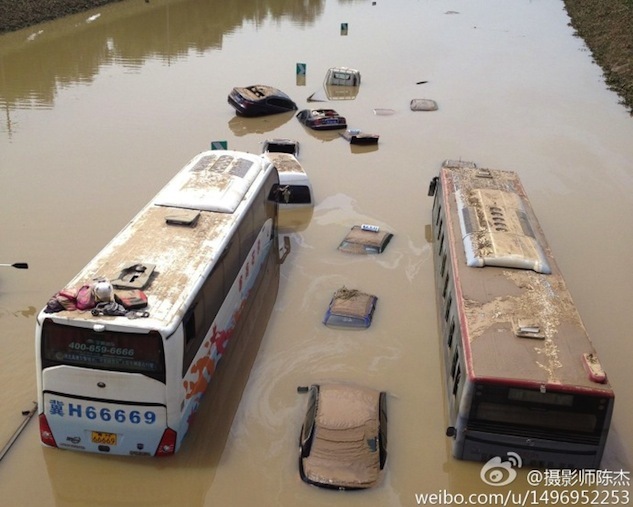 The rain was unrelenting in China’s capital on Saturday, with the government declaring it the worst storm in more than 60 years. Beijing, notorious for having poor drainage, saw its sewers quickly overwhelmed as water levels rose. According to The Wall Street Journal’s China Real Time, at least 37 people died and almost 70,000 residents were evacuated as a result of the storm. Fangshan, a district southwest of the city proper, is believed to have suffered the worst from the catastrophe. The devastation can be seen in fly-by footage from a CCTV newscast posted online (via Bill Bishop of Sinocism). Residents took to Weibo as the situation unfolded. FutureGov Asia-Pacific reports that over 8.8 million Weibo messages about the flooding were sent out over a 24 hour period. Some users turned to the service for help after phones went down. According to the report, 100 students were rescued from a school by the Fire Bureau after an alert was sent out on Weibo. “Similar messages from Weibo have given the authorities information which led to the rescue of more than 400 people in the same district,” author Jianggan Li wrote. Meanwhile, concerned citizens came together on Weibo to organize rides and share lost and found information. FutureGov noted that 520,000 messages about picking stranded individuals up were recorded by Sina.com over the weekend. Official departments also recognized the benefit of the service. The Fire Bureau and other city agencies, such as the Weather Bureau, Traffic Bureau and Water Authority, used Weibo to notify citizens of developments over the weekend. However, Weibo wasn’t just for altruistic purposes. Plenty of disgruntled residents took to Sina Weibo to complain about the situation. The Journal linked to one message with photos comparing sewer systems in Paris, Tokyo and Rome that was reposted almost 1,000 times. “Sewers are not a face-giving infrastructure project,” the publication noted artist Li Yijia as having commented in response to the photos. In other words, politicians may be more prone to building more visible and noteworthy improvements such as high-rises and parks than decidedly less-glamorous sewers. Even as cleanup and restoration is underway, Chinese netizens have been vocal on Weibo. Twitter user @MissXQ pointed out on Monday that Weibo users were “pissed” that police had already begun ticketing stranded cars. Still other citizens were reportedly upset that official media outlets had compared the disaster to Hurricane Katrina and claimed that Beijing was doing a better job handling its crisis. As a technology, sewers have about a 6,000 year head start on micro-blogging. SewerHistory.org (never knew such a site existed!) traces the earliest known instance of a drainage system to 4,000 BCE Babylonia. By comparison, micro-blogging dates back to around 2005, roughly about a year before Twitter was born. Sina Weibo wasn’t the first micro-blogging service in China, but it has quickly become the most-popular since it turned on in 2009. The word “weibo” means micro-blog in Chinese and is generally associated with Sina’s service, despite the fact that rivals like Tencent and Sohu operate competing Weibo platforms. Of course, Beijing isn’t the first city to put social media to work in saving lives, or even effecting social change, as evidenced by Twitter’s role in last year’s Arab Spring, but it is in a unique position to lead a move toward social-based emergency services. China is the world’s fastest growing smartphone market, according to data from Flurry Analytics released earlier this year, and it still has plenty of room for growth. The China Internet Network Information Center claimed that the number of Internet users in the country has grown to 538 million, up 11 percent from last year. Though cost will undoubtedly be an obstacle to increased Internet penetration, which is estimated to have hit nearly 40 percent in June, one recent study expects 80 percent of Chinese households will be able to afford smartphones by 2017. It’s too early to tell for sure, but the collective accountability of the Weibo community may have a positive impact in improving Beijing’s sewer system. Functioning gutters might not have the same kind of ring as revolution, but they could still save lives the next time a storm like this comes through here.